You want to process a PDF-document directly in the browser and sign it afterwards with a signature-pad? Use our signoSign/Web Java Applet! 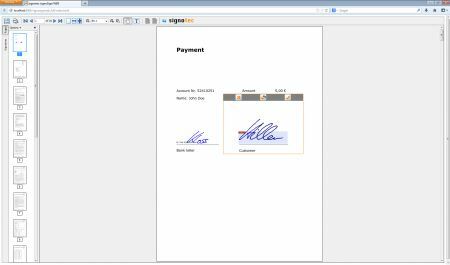 With the Applet you are able to display PDF-documents directly in the browser, and sign them via a signotec signature-pad. Thereby the handwritten signature will be included evidence-proof and in accordance with law into the electronic document. The signature will be carried out referred to ISO and BiPRO standard. The signoSign/Web Java Applet will be applied on a download server (e.g. Apache Tomcat or Microsoft IIS). Via a HTTP/HTTPS call the signoSign/Web Java Applet will be downloaded from the server and carried out by the client. A time-consuming installation of the software is not necessary. Software-Updates can be executed quick and easy via the server. The PDF documents will be loaded by a server. In doing so the signoSign/Web Java Applet is supporting as well PDF-documents with form or signature areas as all other kinds of PDF-documents, in which the signoSign/Web Java Applet is able to include “digital signature areas”. Afterwards you save the signed PDF-document on the server again. The signoSign/Web Java Applet is applicable independently from the browser-environment, no matter if Internet Explorer, Firefox, Chrome or Netscape.